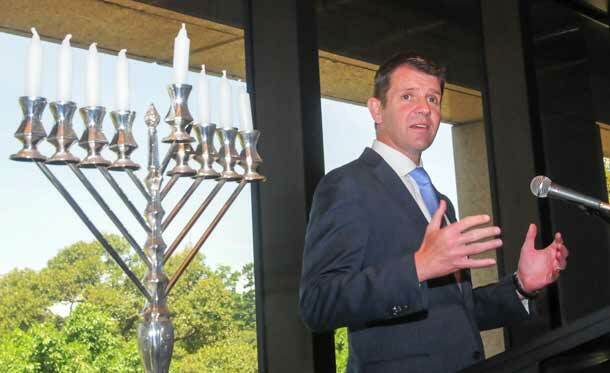 It may a little early to break out the dreidels, but Chanukah candles were lit yesterday at NSW Parliament House. State Parliamentarians from both sides of politics, together with community leaders, dignitaries and representatives from many faiths came to mark the Festival of Lights. The function was organised by The Yeshiva Centre and NSW Jewish Board of Deputies (NSWJBD). Board president Jeremy Spinak explained the significance of the small vial of olive oil that burned for eight days. “The wonderful thing about the Channukah story is it is at once both a miracle and a metaphor for the Jewish people” he said. Dean and Spiritual Leader of the Yeshiva Centre, Rabbi Pinchus Feldman delivered his message hoping that we all “treat each other with appropriate dignity and honour”. 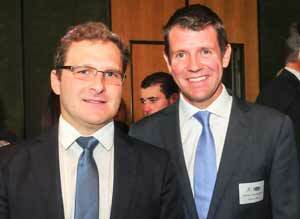 Premier Mike Baird remarked that “often in complex times we look for hope”. The story of Channukah was a reminder that the Jewish community has faced many challenges and has not only survived but thrived.. Channukah is an opportunity to remember that when there are challenges, it is often communal support that gets us through the dark times and into the light. John Robertson, Leader of the NSW Opposition hopes that the large menorah will again be erected in Martin Place. Despite “all the darkness in the world, he believes that “light will always be victorious over darkness” and touched on difficulties facing Jewish communities worldwide. He made special mention of the contribution made by Our Big Kitchen to those in need. Speaker of the NSW Legislative Assembly, Shelley Hancock, informed guests that the beautiful silver mace that preceeds her into the Chamber before a parliamentary session was donated by the NSWJBD in the 1970s. 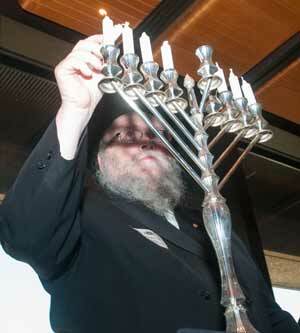 As the familiar Chanukah song Mao Tsur was sung by Rabbi Chaim Ingram, the Menorah was lit by Rabbi Feldman who explained that he had made minor changes to the blessings to allow for the event being held ahead of the Festival of Lights. Politicians and dignitaries sampled the traditional potato latkes and doughnuts and were given chocolate gelt (money) to take home. It really is beginning to feel a lot like Channukah. Separation of religion and state? Somebody rally blew it this time!